What is rhetoric? When I used to ask this question on the first day of my college writing classes, I mostly received blank looks. Most of my students had never even heard the word, much less internalized a definition. For most people who are familiar with the word, “rhetoric” is a negative concept. When we hear the word in mass media, it’s usually used to indicate discourse that is empty of substance; “rhetoric” is persuasive and convincing, perhaps, but not sincere or meaningful. This is particularly true when journalists and others talk about political rhetoric. We think of the rhetoric (mostly speech) of politicians as particularly dishonest and insincere, after all. While this type of speech is rhetoric, it’s not the only kind of discourse that counts as rhetoric. Believing that only insincere and dishonest words count as rhetoric is a bit like believing that only violin notes count as music; we are missing most of the picture. And it is profoundly important that we have a more accurate and complex understanding of what rhetoric is and how it works, because we perform and encounter rhetoric countless times a day. Without understanding it, it is difficult to avoid being fooled, misled, or simply confused by the variety of speech, video, and images you are bombarded by in your life. And it’s even more difficult to communicate clearly to others, argue convincingly, or even express yourself competently. This comes from the appropriately-titled article “Rhetoric” by Malea Powell, Stacey Pigg, Kendall Leon, and Angela Haas. 1 This definition defines rhetoric as concerned with how we know, create, and invent. These three actions cover the traditional rhetorical categories of speech and writing, but also internal thoughts, dress and appearance, architecture, blueprints, reading, video, art, gardening, maps, decoration, photography, landscaping, cookery. This definition also indicates how important the context of any kind of rhetoric is; we cannot analyze or create competently without being aware of the social, political, and economic contexts of that text. An article about terrorism by an American author will be read differently by a pre-9/11 audience than a post-9/11 one. A Thanksgiving meal featuring tamales will impact your family differently if you live in Texas rather than Connecticut. (And it will matter if your family is Mexican-American or not, especially in Connecticut.) Wearing a miniskirt will “say” something different about you if you are 18 rather than 50; if you present as masculine, feminine, or androgynous; and if you are at a club or work. Context matters enormously in rhetoric. Basically, rhetoric involves all human meaning-making; whenever we create or analyze meaning (by taking a photo, putting on makeup, writing or reading a blog post, doing an experiment), we are making rhetoric. And every time we make meaning, we are communicating something to the people who will see it. A nicely-trimmed yard with neat flower beds in a suburban neighborhood, for example, will communicate your conformity with certain middle-class aesthetic standards. A wild garden, on the other hand, communicates that you are rebellious, non-conforming, or care more about a productive space (growing food) than aesthetic standards. Let’s look at one common example of rhetoric and how we (often subconsciously) “read” it. Judging a book by its cover. While many people view judging a person by their appearance as snobby, petty, and/or shallow, it’s generally unavoidable. How we choose to appear to different people in different situations says something about us to different people, whether we like it or not. And, as most fashion-conscious women know, what is “read” from your appearance can be incredibly complex. Everything related to your appearance can affect how others perceive you, including your hairstyle, your makeup, your nail grooming, your personal hygiene, your clothing (what fabric it’s made of, the cut and fit, the color, etc. ), your jewelry, and even visible medically-necessary items like wheelchairs, glasses, and hearing aids. All of these elements combine to create a “text” that is read and interpreted by your audience. This is why most workplaces put a dress code into effect, and why that dress code generally encompasses more than just the clothes you wear. Workplaces want visitors to their company to interpret a certain message, and dress codes help them to force their employees to communicate that message. 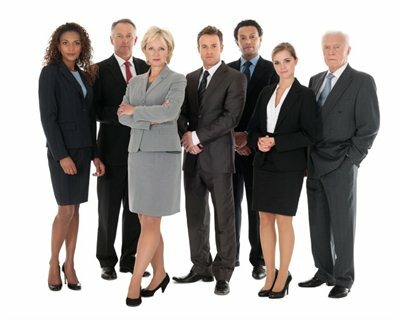 A group of people dressed in “business professional” clothing. If you Google “business professional dress code,” you’ll find a lot of pictures like the above. There are certain cuts, pieces, fabrics, and colors that people in the United States “read” as professional. We expect conservative dress, suits, ties for men, dark dress shoes for men and heels for women (but nothing higher than 2 1/2 or 3 inches), muted neutral colors, etc. These dress choices communicate that the individual is serious about their job, sober, and responsible. If you walk into a whole office of people dressed in this manner, you will probably interpret the company as reliable and dedicated. The risk is that you will also interpret the company as stuffy, boring, and unapproachable. In contrast, if you were to walk into a company with employees dressed in jeans and t-shirts, you may interpret them as friendly, accessible, laid-back, and creative. The risk is that you will also interpret the company as unserious and unreliable. And you’ll come to all of these interpretations by “reading” the appearance of each person you come into contact with plus the appearance of the building and decoration in the office. This is why companies that focus solely on dress code and employee appearance can still fail to communicate their intended message(s). The ways in which you “read” the appearance of those around you is very similar to how you read a written text, like an article or book. You notice, consciously or subconsciously, the choices made by the author and make a judgment about the meaning intended. You may do this in a snap judgment or by analyzing the choices made more thoroughly. The only real difference is what choices the author can make. A writer can only really change some small visual choices, like font choice and size, and relies mostly on their choice of words. A person creating their appearance, however, has a much wider scope of variables (hair, grooming, shoes, clothing, hygience, etc.) that they can alter to change how you interpret their appearance and, ultimately, them as a person. Analyzing rhetoric. Learning to communicate well involves learning how to interpret particular kinds of rhetoric well. Once you learn how certain choices have certain effects in a particular medium, you will become more skilled at making those choices in your own compositions. You can’t merely create, you also have to consume. So, if you want to become a great writer, you need to write a lot, but you also need to read a lot and analyze good writing. If you want to become a great dresser, you can’t merely put together nice ensembles; you should also read fashion blogs or go to fashion shows and analyze what makes for good fashion. If you want to be a great composer, you cannot just write music; you also need to listen to a lot of music and analyze good pieces and how they work. For any medium, if you want to create it effectively, you need to understand how it works and how different choices made by any “writer” affect the audience’s interpretation. Obviously, this means that there is a lot of rhetoric you won’t have time to learn; it would take several lifetimes to become an expert in every type of rhetoric. Most of us won’t have time to delve deeply into art, literature, music, architecture, fashion, programming, scientific practice, etc. And even if you are well-versed in analyzing rhetoric of one medium, you will likely not master all of the sub-categories in that medium. I, for example, am very good at reading and analyzing writing; I can do a close reading of a passage from a Victorian novel, analyze a poem, pull apart the text in a print ad, and dissect the arguments made in a magazine article or blog post. But hand me an academic article in most scientific fields, and I’m generally flummoxed. The rhetorical moves made in that type of writing, the choices made by the authors and expected by the audience, are unfamiliar to me. I’d have to talk to a friend or colleague who is familiar with the rhetoric of science before making any judgments about the validity of an argument in that medium. This series on rhetoric focuses on visual and written rhetoric, but the principles in the articles are easily applicable to other kinds of rhetorical mediums. If you want to learn more about rhetoric of other mediums, like music or architecture, then we suggest that you start with a Google search of “rhetoric AND [the medium]” and asking a librarian at your local library or, even better, a local university library. Want to be alerted when we publish new writing help? Subscribe to our newsletter! Return to the Writing Help page here.